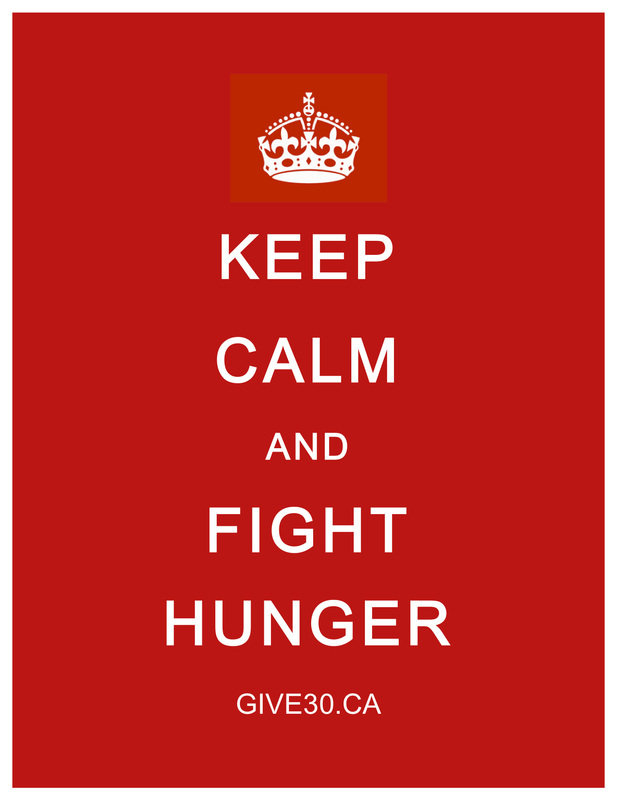 Here are some cool posters to help motivate and spread the word on Give 30. Let's see if we can make these into social media memes. Price: Free. Gratis. Zip. But, please share by printing and posting on bulletin boards at your workplace, condo, community centre, or by going with some guerilla advertising in your 'hood. And, feel free to use these posters to spread the word on social media and on your website or blog. Great wisdom from ye olde days in Blighty. Keep a stiff upper lip and stay the course. It worked for Blighty, it can work for us Canucks. Download the pdf below of the poster on the left in classic red. In compliance with the Witticism Conservation Society's "Don't Waste Wit" rules, please see text for poster above. Download the pdf below of the poster on the left in trendy GIve 30 campaign orange. 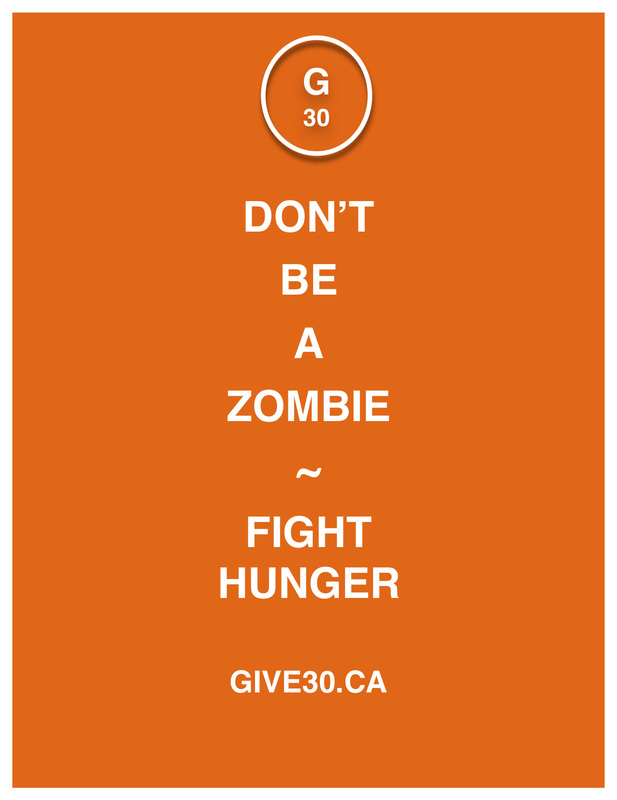 Don't be a zombie - download the pdf below of the cool poster on the left and do your anti-zombification duty by spreading the word about Give 30 and the fight against hunger. 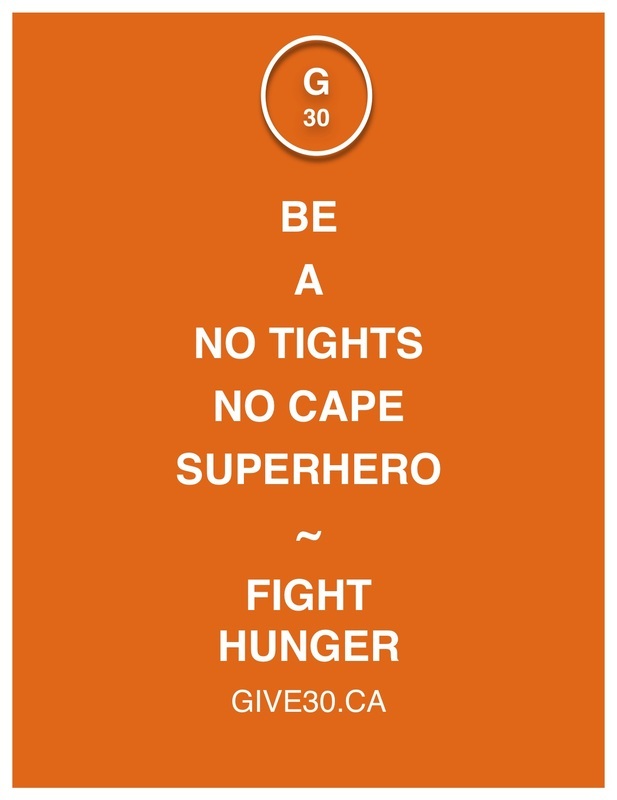 Channel your inner lightning bolt and focus all your energy on zapping hunger where it counts by spreading the word about Give 30 and the fight against hunger. Feel free to download the pdf below of the cool poster on the left and use it in your zapping efforts. You don't need to leap tall buildings, catch speeding bullets or race locomotives (though, it can't hurt if you can bring those skills to the fight) to be a real superhero in our community. The spectre of hunger still looms across our fair community and it's up to you to help defeat it. You won't have to endure epic battles and you'll be home for supper. No matter how it's said, we can beat hunger together. Put that dictionary down and get busy in the fight against hunger with Give 30. So, you don't look good in tights (even the trendiest yoga pants style), and well, capes just don't suit your style. That's no excuse to let hunger win. 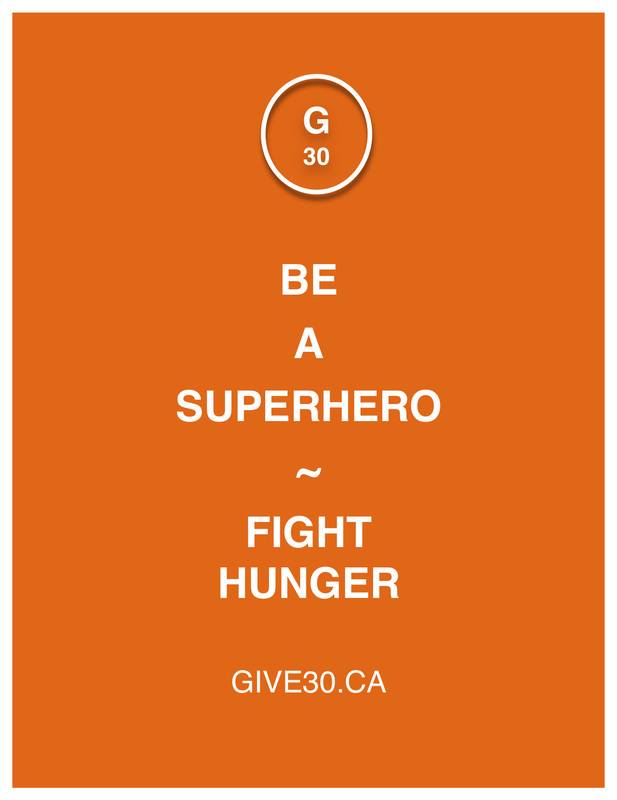 You can still be a hunger-fighting superhero. All you have to do is support Give 30 and spread the word. See, that was easy, eh!? You know what Ramadan's all about - fasting to learn empathy and then share with our neighbours. It's pure superhero stuff, man. In fact, it's in the superhero job description. Really. No fancy gym, equipment of fees required for this boot camp. It's portable because it's in you all day, every day. 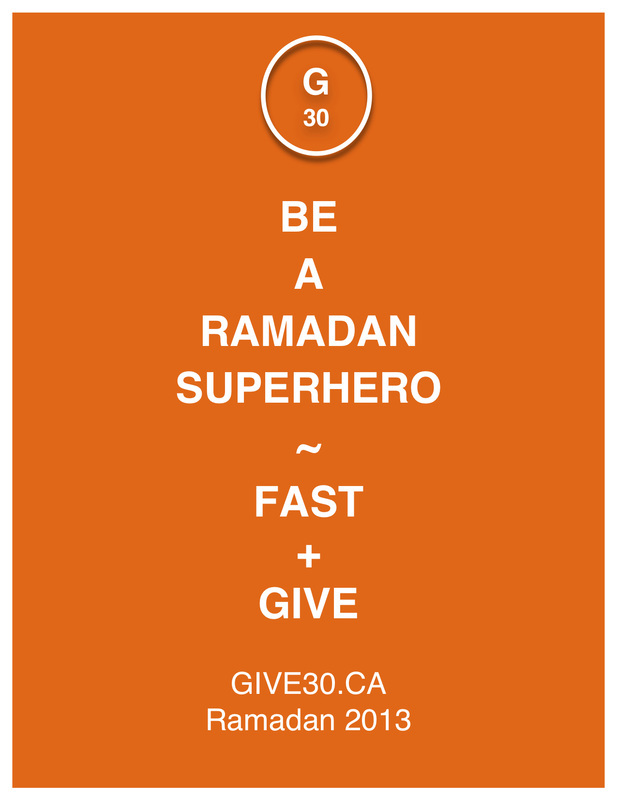 Get busy exercising those empathy and sharing muscles with Give 30 this Ramadan. This one boils it down to the essence, eh? It's tough being a relevant poster these days. What with all the bling and pizzazz that these new fangled young posters have. But, you know, it's all smoke and no fire. Plain, simple and to the point. Still the king of posterdom.